Check the list of all our publications at http://publications.physics.muni.cz/author/ceitec and download full text files after loging on as guest. The research group operates on the premises of Department Physiscal Electronics and CEITEC Core Facilities. We develop and investigate low and atmospheric pressure plasma processing of materials. The understanding of the processes and interaction of plasma with surfaces is achieved by plasma diagnostics, process monitoring and simulations of related phenomena (electromagnetic field, gas flow, heat transport, plasma). Coupled model of gas dynamics and the electromagnetic field in a microwave plasma torch operating at the atmospheric pressure in an inhomogeneous argon/hydrogen mixture. Gas dynamics model of gas flow and heat transfer in a radio-frequency jet for bioapplications. A model of gas dynamics and precursor consumption in a dielectric barrier discharge with the aim of gas supply optimization. Currently, our main focus lies on self-consistent modelling of atmospheric discharges with bioapplications. Optical emission spectroscopy for electron denisty and gastemperature measurements. Thomson scattering for electron density and temperature measurements and Rayleigh scattering for gas temperature measurements (in collaboration with Technische UniversiteitEindhoven). Laser schlieren deflectometry for gas temperature measurement. Microwave plasma torch is atmospheric pressure device that provides high temperature, electron and energy density. In applications it is most suitable for conversion and synthesizing processes where it can achieve full breakdown of the precursor molecules to active radicals. We have successfully utilized this device for synthesis of nanoparticles and nanotubes and also studied by diagnostic methods and modeling. The plasma (co)polymerization is applied for a surface modification by coatings containing (bio)active groups (carboxyls, amines, ...). We develop plasmachemical processes that utilize non-toxic monomers. The coatings can be applied to different substrates because the processes take places at temperatures closed to the room temperature. The coatings are tested in sensors, for immobilization of biomolecules and for the modification of biodegradable electrospun polymer nanofibers aiming at the applications in tissue engineering. Organic/inorganic organosilicon coatings with tuned hybrid structure are deposited by PECVD from organosilicon monomers (e.g. hexamethyldisiloxane - HMDSO) in low pressure RF discharges, atmospheric pressure DBD and RF plasma jet. We develop and investigate hard coatings based on diamond like carbon (DLC) prepared by low pressure PECVD. Multilayer amorphous diamond-like carbon films with graded silicon and oxygen content exhibiting hardness in the range from 16 to 24 GPa were deposited using low pressure PECVD. Gradients in elastic properties of a coating can provide substantial improvements in the resistance to indentation. The variation in elastic properties of the thin film were achieved by composition change, simply adjusting the deposition conditions during the film growth. The films were optimised for deposition on steel substrates. To evaluate the impact resistance of graded amorphous carbon films in dynamic loading wear applications an impact test has been used. During testing the specimen was cyclically loaded by tungsten carbide ball that impacts against the coating surface. The results demonstrate the usability of these coatings in dynamic load and enables the optimization of the coating/substrate system design for a particular use. The films with optimum structure exhibited very good resistance against delamination, high fracture toughness and low friction coefficient. The principal new finding concerns the fracture toughness of the film and the interfacial adhesion. Upon impact testing the films remain attached to the substrate, even at impact loads exceeding 200 N. The films can sustain compression strains without debonding or spalling. Reference: V. BURŠÍKOVÁ, J. SOBOTA, T. FOŘT, J. GROSSMAN, A. STOICA, J. BURŠÍK, P. KLAPETEK, V. PEŘINA. Optimisation of mechanical properties of plasma deposited graded multilayer diamond-like carbon coatings. JOURNAL OF OPTOELECTRONICS AND ADVANCED MATERIALS, Vol. 10, No. 12, December 2008, p. 3229 - 3232. Very thin films of TiO2, HfO2 and other oxides are prepared by atomic layer deposition (ALD) or plasma ALD. Additionally, we investigate the structure of TiO2-based ternary oxides prepared by PECVD. In MW torch, a fast synthesis of iron oxide (maghemite, hematite) nanoparticles and nanostructured coatings can be tuned to desired applications including in-flight coating of nanoparticles for a core-shell structure. Iron oxide nanoparticles (NPs) have a wide range of applications that can be generally divided into two branches with respect to either their magnetic or chemical properties. The magnetic applications often utilize the superparamagnetic behavior of NPs and include for example; selective drug delivery, magnetic resonance imaging or hypertermia treatment. The chemical applications include carbon nanotube synthesis, pollutant degradation and water remediation, molecular imprinting of polymers, analytical fluorescence techniques and solid phase extraction. Iron can occur in several oxidation states, FeO, Fe3O4 and Fe2O4, with several corresponding polymorphs. Ferrimagnetic magnetite (Fe3O4) and maghemite (gama-Fe3O4) NPs with the size below 20 nm exhibit superparamagnetic behavior. Hematite alfa-Fe3O4 has been widely known for its catalytic properties. epsilon- Fe3O4 was found to exhibit a huge coercive field of 20 kOe at the room temperature. We have developed novel methods for synthesizing and characterization of NP which allow us to produce tailored size and phase of NPs in single step plasmachemical synthesis. Synthesis takes place in atmospheric pressure plasma torch described in (Plasma processing of materials, plasma diagnostics, process monitoring and simulations). Characterization methods include Raman spectroscopy, XRD powder diffraction and Infrared spectroscopy. Carbon nanotubes (CNTs) and graphene nanowalls are synthesized directly on the functional devices, e.g. sensors, using the MW plasma torch or by CVD using iron catalytic nanoparticles synthesized in the torch. Graphene is grown on copper foils by CVD. The CNTs or graphene are functionalized by plasmachemical method for enhanced sensing properties, imobilization of biomolecules, better dispersion in liquids (e.g. for spraying) or improved dispersion and covalent bonding in polymer matrixes (for composites). Plasmachemical modified carbon nanomaterials can find applications in smart textiles, multifunctional polymer composites, (bio)sensors, supercapacitors, batteries etc. Possibility to use the gas sensors for a wide range of industrial and toxic gases or gas mixtures (CO, CO2, CxHy, NH3, NO2 etc.). The optical characterization of thin films and surfaces is performed by the combination of ellipsometric and spectrophotometric measurements in the wide spectral range. We develop own software (newAD) for the solution of advanced and complex problems. The characterization provides information not only about the thickness and optical properties (refractive index and extinction coefficient) but also about non-uniformity, inhomogeneity, existence of interlayers, roughness, changes in chemical composition and electronic band structure. A unique normal-incidence imaging spectrophotometer in UV-visible-NIR spectral range with spatial resolution of 37 µm was built at Institute of Physical Engineering FSI BUT. 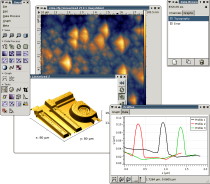 Our group develops data processing methods and software for this instrument and applies them to optical characterisation of highly non-uniform thin films, with focus on precise mapping of film thickness. The applications include for instance characterisation plasma jet-deposited films and mapping of roughness of non-uniform rough ZnTe films. The advanced studies of mechanical properties of thin films and nanomaterials is carried out by instrumented micro/nanoindentation and nanoscratch tests. The complex analysis of relation between nanoindentation response and material structure is performed for thin films, multilayered and nanocomposite materials. Recently, the measurement in liquids for the samples with potential bioapplications and the measurements at the temperatures up to 800 oC are investigated. The Hysitron TI 950 TriboIndenter is a nanomechanical test instrument with a high degree of sensitivity and excellent performance. Its Advanced Control Module improves the precision of feedback-controlled nanomechanical testing, provides dual head testing capability for nano/micro scale connectivity, and offers very good noise floor performance. Several different nanomechanical testing techniques are currently possible, making the TI 950 nano-indenter system an effective nanomechanical characterization tool for a wide range of applications. Quasistatic nanoindentation – Measure Young’s modulus, hardness, fracture toughness and other mechanical properties via nanoindentation. Scratch testing – Quantify scratch resistance, critical delamination forces, and friction coefficients with simultaneous normal and lateral force and displacement monitoring. Top-down optics – High- resolution, color CCD camera for individual structure identification and coarse test positioning. Long probes that allow to safely investigate the mechanical properties of samples imersed in water. Photo during testing of a sample immersed in water. The open source software Gwyddion is developed in close collaboration with the CEITEC RG Development of Methods for Analysis and Measuring and a large number of participants from other institutions throughout the world. It has become a standard software in the field and is used by thousands of scientists. Gwyddion was designed as a cross-platform and extensible. It consits of three main parts: libraries providing core data processing routines, GUI elements and utility functions; modules that provide specific data processing and file functions; and a small and simple application itself that primarily serves as a glue connecting everything else together. Support for more than 100 SPM file formats. Processing of data under arbitrarily shaped masks. Single point spectra and volume data support. Generation of artificial surfaces and measurement simulation. The development of Gwyddion is naturaly connected to development of data processing methods in SPM. Examples includes methods for the analysis of nanoparticles under non-ideal conditions or statistical characterisation of roughness in irregular rough regions. Quantitative analysis of SPM data should also include uncertainties of the obtained parameters. This requires the characterisation of measurement errors in SPM, both systematic and random, and their propagation through data processing calculations. For quantitative analysis of data acquired using novel SPM scanning modes, such as fast point spectroscopy and imaging, it is crucial to have available independent data processing methods that can be applied off-line (after acquisition) and consistently to data measured using different instruments. Thanks to the open-source nature of Gwyddion, all algorithms implemented there can be examined and verified at the source code level, which is key for comparablity of results and further progress to standardisation in nanometrology.